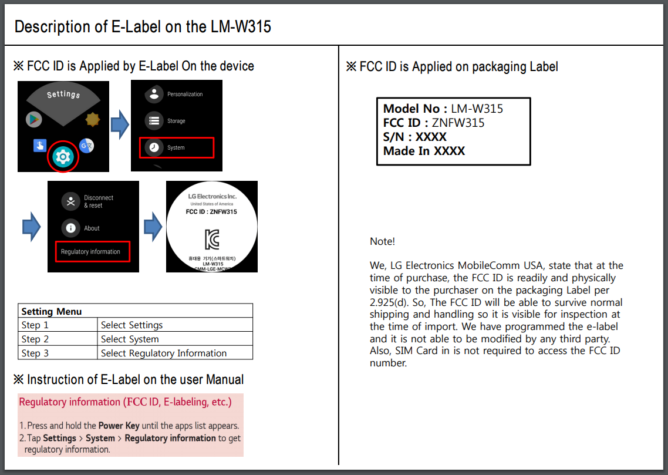 Documentation concerning a new Wear OS watch manufactured by LG has appeared on the Federal Communication Commission's website. The listing doesn't reveal a whole lot, but the watch is described as a "portable wrist device" with a model number of LM-W315. It's possible the filing is for LG's rumored "hybrid" watch that's said to feature both physical hands and an LCD display. While none of the accessible documents mention Wear OS or Android by name, one does contain screenshots that give it away. Connected devices are required to display FCC certification information, and since real estate on a watch is limited, smartwatches display the information in their software. A section in the filing detailing how to access the information clearly shows Wear OS. While the above section does make reference to SIM cards, it seems the device won't feature LTE—or NFC. The filing's RF exposure documentation only mentions Bluetooth and Wi-Fi, which would mean no phone-free use and no Google Pay. Bummer. A new FCC filing has been spotted by Droid Life, for a wearable with a very similar model number: LM-W319. The filing is largely the same and similarly vague, but it does seem LG is working on multiple wearables.